Those of us old enough remember where we were on 9/11. I was in sixth grade, excited when our teachers told us we got to go home early as the rest of my peers were, and confused when they said it wasn't something to be celebrated about. I don't remember the days following or the days before, but I will always remember certain details of that day. Towers Falling does an excellent job of teaching young children about an important and tragic day in United States history. A young girl, Deja lives in New York in a new school and new friends. Their teacher starts to teach them about 9/11 and other times America was attacked as September rolls around. Deja never noticed until now, 15 years past 9/11 that her father was getting sick every year around the same time, every year around September. I love the oeverall theme of this book, we are all family, we are all there, as Americans to take care of one another. Its about children learning this through a horrible tragedy in history. I felt very emotional throughout this books, when the children learn about the planes flying into towers, wondering why terrorists hate Americans so much. A question, many of us still wonder today. 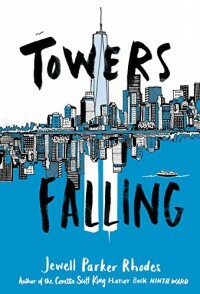 Towers Falling is a short but powerful read. One I would recommend to teachers and librarians wanting to teach about 9/11 and the importance of accepting one another.